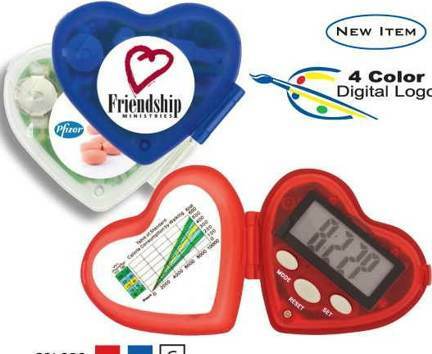 Personalized Heart Shaped Pedometers w/ Clock. Promotional, Inexpensive. Lowest prices in the USA, Canada. Bulk personalized heart shaped pedometers with clocks at the Budget Prices in USA and Canada. American clients pay no taxes. An easy to use compact plastic pedometer equipped with a digital clock and step, distance and burned calories counters! Also comes with a feature that enables you to set your stride along with a reset button, cover and a belt clip for comfortable wearing. For best accuracy wear in on your hip. We also supply wholesale blank (not custom imprinted) heart shaped pedometers and direct import heart shaped pedometers at lower prices (please scroll below our regular Price Table to see the lower factory direct prices). Free artwork design. We will send you a proof for your approval before production. Unit prices below include your full color custom imprint. American clients pay no taxes. We also supply blank (not imprinted) heart pedometers - contact us for details. Production Time: 5- 7 days after art approval. Blank pedometers ship next day. Free full color custom imprint! Colors: Translucent Red, Blue, Clear.